The Rainy River Bees are an elite peewee hockey team. Moments after winning a championship, they get abducted by aliens—aliens that love hockey! 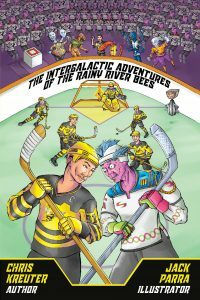 They rocket across the universe to play in the Intergalactic Hockey Championships, where they face-off against strange aliens with even stranger rules. But what seems to be friendly competition hides a dark secret that puts the entire universe in peril. It’s up to the twelve Bees and their new friends to save the day: and win the tournament! The Shortcut: Enlightenment in a box for only $149.99! Flip the switch & experience nirvana. This was the result of Terrance Gray’s accidental invention: Headphones that harmonize brainwaves and create a state of complete non-thought. None of his retreats to fancy Buddhist monasteries ever brought him close to the enlightenment he achieved with his prototype. With the help of an angel investor he sells enlightenment wholesale and taps into a pent-up demand to bypass desire and escape the trappings of modern society. Shortcuts start selling by the millions, but not everyone is sold on the benefits of effortless personal transcendence. Terrance finds himself in the crosshairs of a new group, the Unified Unenlightened, who form to prevent the shifting of a global economy dependent on scarcity driven capitalism. 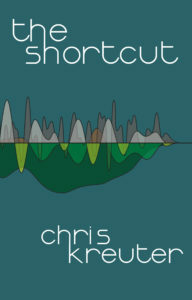 Terrance is forced into hiding, where he has to confront a world struggling to adapt to a post-enlightenment world.